Perfect strangers. A perfect holiday. The perfect murder...Three couples meet around the pool on their Florida holiday and become fast friends. But on their last night, their perfect holiday takes a tragic twist: the teenage daughter of another holidaymaker goes missing, and her body is later found floating in the mangroves. When the shocked couples return home, they remain in contact, and over the course of three increasingly fraught dinner parties they come to know one another better. But they don't always like what they find: buried beneath these apparently normal exteriors are some dark secrets, hidden kinks, ugly vices...Then, a second girl goes missing. Could it be that one of these six has a secret far darker than anybody can imagine? A brilliantly plotted, utterly gripping thriller about the danger of making friends on holiday, Rush of Blood is Mark Billingham's most ambitious and accomplished work to date. 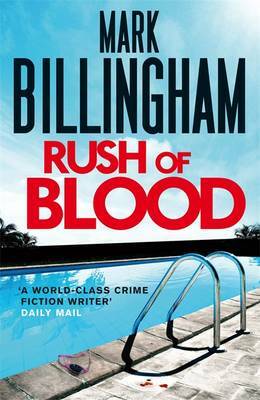 Deviating from my preferred genre of fantasy/supernatural I invested in my first Mark Billingham book - Rush of Blood. I have to say I was not disappointed! Rush of Blood had me hooked from start to finish! The plot seemed a little luke warm at first.